To me, Talon represents how a little bit of backstory and an interesting quirk can add a whole lot of flavor to an otherwise mechanically bland item. I can already imagine the awkward social situations that could arise when the PCs dine with a noble or at the royal court. And I don't think I need to mentioned that there are a minimum of three solid plot hooks that jump out at you. 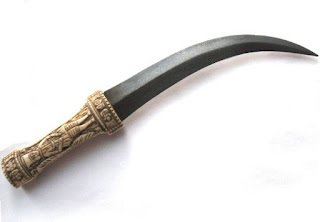 A carved ivory handle contrasts with the obsidian color of the dagger’s talon-like blade. Four figures, their likenesses worn beyond recognition, and a series of indecipherable hieroglyphs, encircle the handle. This dagger started out as a ceremonial blade for a long-dead desert cult. Scholars know little about the cult aside from the fact that they venerated an individual known as the Prophet of the Red Sky. It is believed that the cult’s demise came when the congregation was buried alive in their temple by a powerful sandstorm. This dagger was discovered when the temple was unearthed and bought by a wealthy collector. It disappeared, however, when the collector’s manor was robbed. The wielder develops a habit of using Talon as a dining utensil. Slot none; Price 2,302 gp; Weight 1 lb. This magical dagger has a +1 enhancement bonus on attack and damage rolls.